Poor posture accumulates pressure on the spine over time and a variety of resulting conditions then put pressure on the sciatic nerve, causing pain. Pain can intensify when moving suddenly or when changing positions. Every individual is a different shape and size, even two people of the same height and weight will require different settings in a chair. Corrigo chairs recognise and embrace this individuality and our chairs therefore provide far higher levels of adjustability found in most chairs in the market place. The key areas of support needed to prevent and reduce sciatica are the lumbar curve, the upper back and arms. 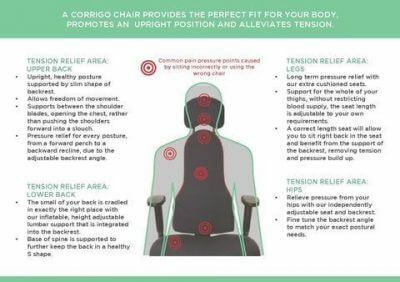 Or click HERE for more information on the Corrigo chair for sciatica, The Libero.